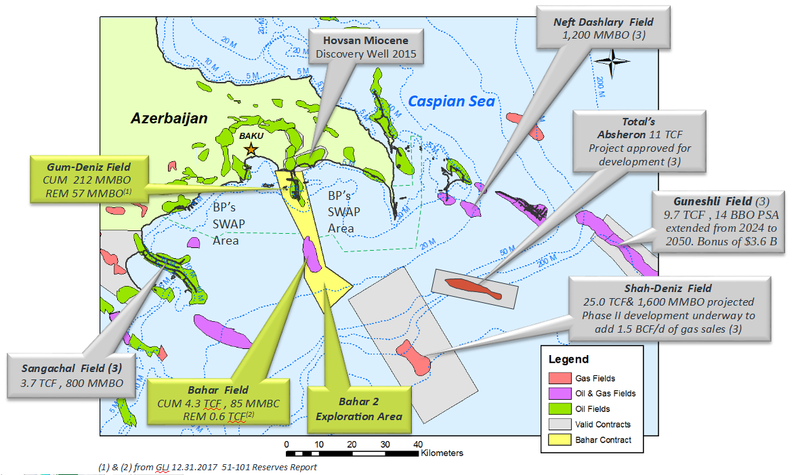 Greenfields Petroleum Corporation, through its wholly owned subsidiary Bahar Energy Limited (BEL), owns an 80% interest in the Exploration, Rehabilitation, Development and Production Sharing Agreement (the “ERDPSA”) with SOCAR and its affiliate SOCAR Oil Affiliate (“SOA”) in respect of the offshore block known as Bahar Gum Deniz (the “Bahar Project”), which consist of a Contract Rehabilitation Area (“CRA”) including the Bahar Gas Field and the Gum Deniz Oil Field and an Exploration Area (“CEA”). The ERDPSA was ratified by the Azerbaijan Parliament on 27 April 2010 and became effective on 1 October 2010. The Bahar Project comprises nearly 76,500 acres of a producing oil field near the Baku coastline and a producing gas field 10 km offshore in shallow waters (10 metres) of the Caspian Sea. Originally owned by SOCAR, the Bahar Project was awarded as a concession under the ERDPSA.